Often neither player will be the clear winner of a ko. Instead, the winner must ignore a ko threat to win the ko. What the loser of the ko gains from that threat minus the loss of the ko is the ko exchange. In the game, Black responded at and White recaptured the ko at . 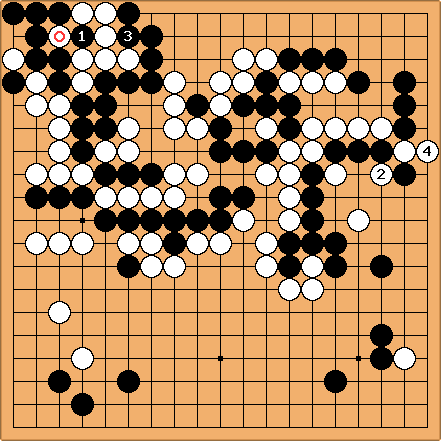 Now Black played a ko threat at . Suppose now that captures through and finishes the ko. Black will then execute his threat with . We need no calculation here: Black saves his central group from capture while converting the upper side into territory. There is no way White will accept this exchange. RobertJasiek: The stub is misleading. Of course, ko exchange is something different than ko threat. Surely, more explanation and examples can help. But the stub is superfluous and suggests the wrong thing (that this page might be superfluous)! tapir: Imo, ko exchange is the whole process of "lose ko, get compensation" not some balance accounting. RobertJasiek: Ko exchange is used in either meaning: 1) balance accounting, 2) process of letting one player win the ko and the opponent get compensation. Dieter: The term "ko exchange" is referred to quite often here at SL. However, this page originally said something trivial like "the winner is not always defined, so mostly there is an exchange". I thought I'd stuff this idea with an example. Obviously ko threats play a role and so balance accounting is never far away. But I agree this accounting is only part of the process. In the above example, hardly any accounting needs to be done since the threat is just too strong. If the exchange is balanced, then accounting is helpful. Or do you guys see it differently? Can you elaborate what you understand by ko exchange? tapir: "What the loser of the ko gains from that threat minus the loss of the ko is the ko exchange. " - this is mystifying. Isn't this just a special case of furikawari? Of course you need positional judgement to not lose points in the process, but what is happening is the exchange (of potential territories etc.) not the accounting procedure. RobertJasiek: 1) A ko exchange can (but need not?) be considered a special kind of exchange (which a Japanese-English term sometimes calls furikawari; I do not know if the Japanese term in Japanese has the same meaning). 2) Of course, one does not need (global) positional judgement, but, if one wants to express things with values, one needs some evaluation method. This can be (a ko exchange put in) global positional judgement, but can also be the method of local unsettled group average, which is derived suitably from per move endgame value calculations (see Joseki Volume 2 Strategy). 3) Didn't Charles Matthews propose further evaluation models?